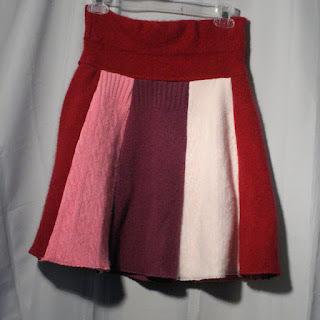 So many of the women who see my sweater skirts for little girls have said, wistfully, "Can you make them to fit me?" that I began to really think about how it could be done. 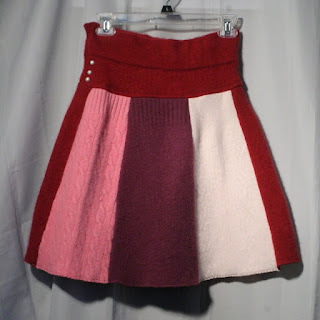 All of the little girl skirts I make are made from just one sweater, and for the most part that isn't workable for adults. So here is a way to make it work - the gored skirt. Each of these panels is made from the sleeve of a sweater. The waistline is made from the bottom of a sweater and has an elastic waist band inserted to give it a little bit more stretch. Another great way to recycle!